These are the love of my life. I will never be who I am if it’s not because of them. It is very obvious there were few members missing in this portrait, it's because they could not make it. This was taken during our previous visit in the Philippines after 4 and half years of being away. 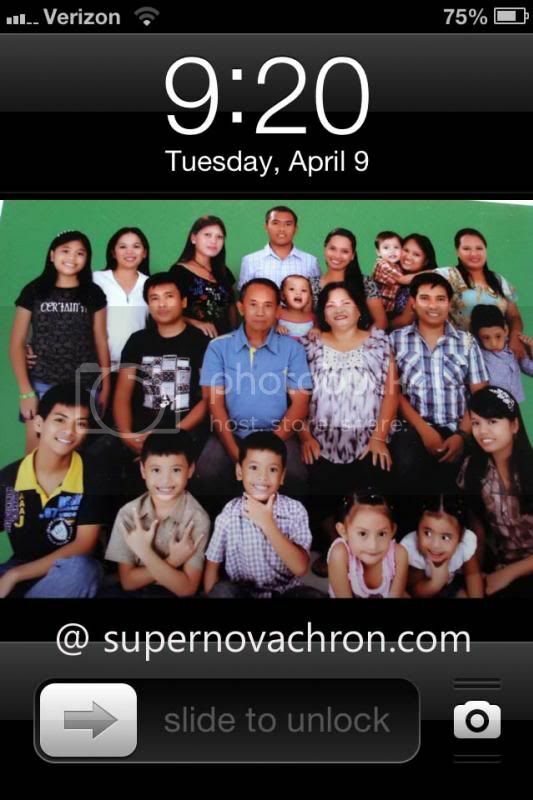 This was last January 2, 2013, right after New Year when the family decided to update our Family Portrait. Everyone seems to be excited and happy that we did. Oh! The experienced during that time at the photo studio is unforgettable. With all those kids, the small space of the studio and the noisy conversations gives the photographer an irritable face. Too bad for her, we are having blast. I don’t remember how many minutes we stayed inside to finish up the pictorial. But what I could remember is the happy faces of each member. I missed them so dearly, and this is what you can see on my Cell phone Home screen. At least I could see everyone through here and remember the fun days we have while taking this photo. Three generations in one picture. what a sweet family memory! Nice reminder to capture time together. You have a beautiful family sis! I would love to be able to get a multi-generational photo like this! What a bit beautiful family you have. I would love to have a big family but it does not look like it will ever happen. If you ever need an adopted sister, I am available, lol. I LOVE your photo. You have a great looking family. I have to say the 2 little boys in the front cracked me up!